Left back Toni Lato, 20, is considered one of the brightest defensive prospects in Spain and Europe by many top scouts and coaches. The full-back has come through the ranks with Valencia and this season has burst on to the scene as a prodigious young talent who has now featured for the first-team on a regular basis. As a 14-year-old boy, Lato had been coveted by the likes of Barcelona and Real Madrid, but opted to stay with his boyhood club and has been rewarded for his loyalty with representation for Spain's under-21 side over the past year, as well as regular starting XI action for the La Liga side. In recent days, has again been called up for Spain's under-21 side and some are asking whether or not the player could soon enjoy full international honours for Spain. What makes Lato truly special is his pace, acceleration and tackling ability, those key attributes give him the ability to move forward with the direction of play and get back to defend wherever necessary. He is also a proficient attacker, able to get forward and find space from defensive positions if necessary. 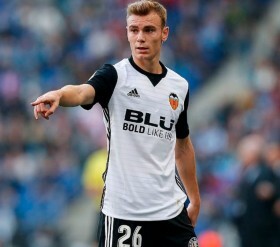 In June 2015, Lato signed a five-year deal with Valencia and talks are ongoing with regards to extending his current deal, in a move that will make the left-back one of Valencia's highest paid players, such is the club's desire to keep hold of the youngster for his best years. Respected British magazine FourFourTwo voted Toni Lato as the best young left-back in the world in November of 2017, alongside the likes of Kylian Mbappe and Donnarumma of AC Milan amongst some of the best young players of the world.